Over recent years, Rihanna has achieved so much, but 2017 is proving to be one hell of a year as Harvard University has just selected the much-loved singer as their Humanitarian of the Year. Rihanna accepted the honour with a moving, yet humorous speech that melted our hearts a little more. On accepting this prestigious award, the 29-year old noted this was a humbling experience, and joked that she had made it to Harvard. Rihanna thanked the Institute for the award. She explained also, how watching TV commercials as a child that requested viewers to donate money in order to save lives had impacted her attitudes surrounding charity. 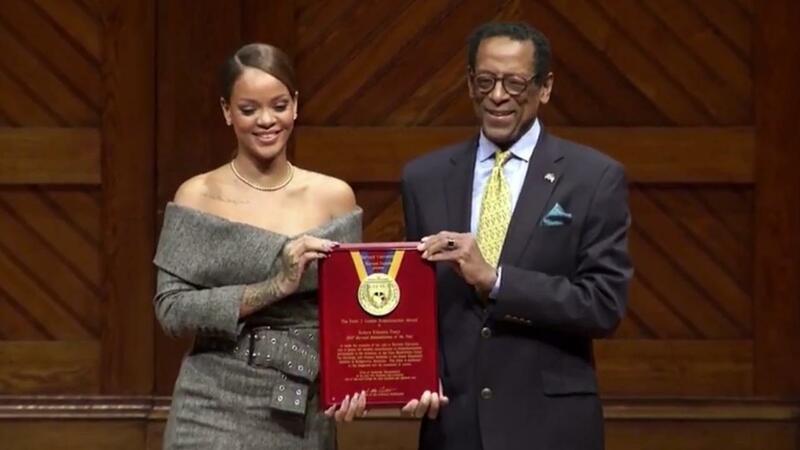 Each year the Harvard Foundation honours prominent and public-focused figures, and this year chose to award Rihanna the Peter J. Gomes Humanitarian Award for her charitable work. Some of the help Rihanna provided was to set up the Clara Lionel Foundation a program aimed at supporting impoverished communities with education and healthcare. Furthermore, Rihanna funded a Centre for Oncology in Barbados. Congratulations Rihanna, you are an inspiration to us all.